Growing up in hotels was like living in a constant amusement park. Swimming, jet skiing, boogie boarding, diving, wind surfing, tennis, golf or simply lazing, we could do anything we wanted, whenever we wanted. The fact that we lived in Qatar and were guaranteed 363 days of sunshine, added to the pleasure of the perfect amusement park atmosphere. As my dad worked in luxury class resort hotels we were also used to doing things others thought of as pure indulgence. Like the fact, we simply went into the main kitchen and helped ourselves to whatever we wanted. The chefs and pastry chefs knew us from a very young age and spoilt us with exotic foods and desserts. We got what we desired whenever we craved it. Sounds like we were spoilt brats, doesn't it? Thanks to fantastic parents, who always found it very important to teach us the values of respect, modesty and courtesy, both my brother and I never took anything for granted. We always knew where we stood, knew that what we had was something special but nothing we should take advantage of. So, we always appreciated the waiter who went out of his way to get us a special fruit juice cocktail or adored the pastry chef for making our favorite dessert. Today, it is upon me to teach these same values to my son. My dad still works for fancy hotels, but now he says he can take leave of playing the teacher role and fully concentrate on spoiling his grandson. As I am currently in Dubai visiting my parents I see so much of history repeating itself. Soeren spends his days on the beach or the pool, lunches are at the restaurant where a buffet of exquisite food is on display. If he does not like something on the buffet, he is guided into the kitchen where he is spoilt rotten by the kitchen staff. He comes back with a bowl of mousse au chocolat, or sticks of chocolate, pasta with tomato sauce - whatever he wants, whenever he wants it. On one side I have to remind myself that we are on vacation and throughout the year he does not lead this lifestyle. So, I should not be as strict as I think I should be. On the other side he is 5 and at this age, I believe they are ready to be molded into what they become and think later on in life. I have to induce a few valuable lessons. It's a balance act. But I am lucky because I have an intelligent and sensible boy. He takes in what we tell him with an eagerness I have not seen in kids his age. He will repeat things, as if to remind himself, and follow the guidelines to his best ability. One thing I remember about growing up in the hotel in Qatar was the poolside bar. The food was not specifically out of the ordinary - your typical grilled fish and meat, burgers, sandwiches and salads. However, among all the fancy food readily available to us there was one that I loved. It was a simple platter of fresh fruit served with a delicately flavored fruit sauce, granola and cottage cheese. The fruit was always fresh, juicy and sweet, served with the three variations - tangy sauce, crunchy granola and creamy cottage cheese - it was always an exciting new combination of flavors. Perfect after spending part of the day in the hot sun. Also perfect for this month's Monthly Mingle theme. Abby, who is this month's guest host, selected a spectacular theme for this month - Spring Fruit Sensations. 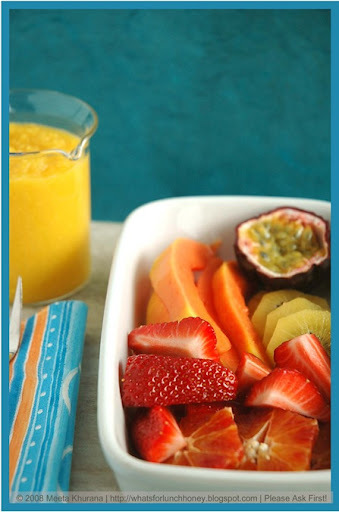 What can be more sensational than a platter of fresh fruit served with mouthwatering condiments? Put all the ingredients for the sauce into a food processor and process until the sauce it thick and smooth. Lay all the fruit onto a large platter. Arrange granola and cottage cheese in small bowls. 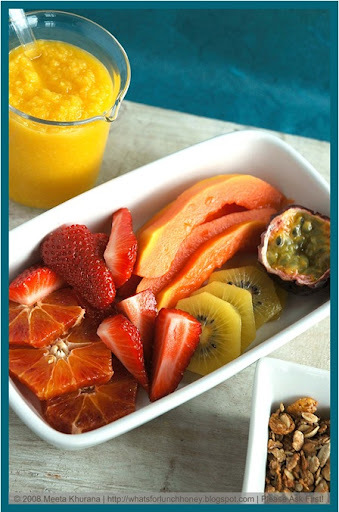 Serve fruit spooned with the ginger mango sauce, sprinkled with granola or just eat the fruit with cottage cheese. Fresh, fruity and simply full of spring. There is no better way to describe this. The fruit complemented with the ginger mango sauce is scrumptiously tangy and succulently sweet. I love the added crunch of the granola - it adds a lovely body to the dish. All I say is - sensational! Fresh fruit, it's like candy! Your pictures Meeta......I don't want to blink, they are that good!!! Simply beautiful, Meeta. Proper fresh fruit is an unbeatable dessert. ooh - Ginger and Maple Syrup, theres an intriguing combination! On a different note, its so good to see that you can be objective about you son. Its hard to be an objective parent! Plase do not hesitate to let me know either ways. Many thanks! When I was little, my grandparents owned a wholesale toy business. Every Sunday I would go with them to the "store", where my grandmother would do the books and my grandfather would let me take any toys or games I wanted. Yes, I was spoiled a bit -- but my parents always instilled balance and perspective, and I certainly didn't grow up to be a spoiled adult. 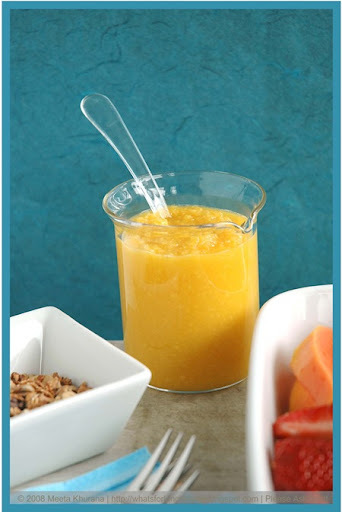 Fresh fruit and ginger mango sauce, that is the stuff! Yummy, yummy! Nothing beats fresh fruit, and I can't wait for the first strawberries to appear at the market soon. Thanks for giving us a sneak preview of warm, relaxing days ahead! Nice looking breakfast. That ginger mango sauce sounds pretty tasty. Rich and basic, simple and elegant: fresh fruit. That's balance. I'm sure that, being raised by you, your kid will know how to appreciate and be thankful for the good things in like as well as for the people who provide those things to him. What a wonderful childhood you had! 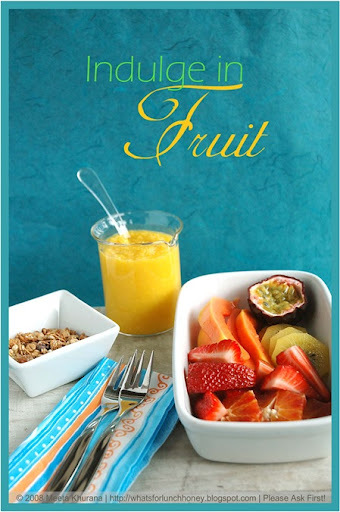 And it sounds like you are a wonderful mother as well :) This fruit sounds perfect - a great way to welcome in spring! I have a cousin named Meeta! Quite similar to the recipe in the book "Eat, Live, Love: The Great Tasting, Low Carb, High Fiber, High Protein, Super Healthy Recipes that You've Prayed For"
I added some flax for health benefits :). I cater for functions from time to time and make this sauce for serving with homemade vanilla ice-cream. Your addition of the fresh ginger sounds divine. Ginger mango sauce is simply divine. I'm always made it with muscovado sugar or succanat, I really like the idea of adding maple syrup instead. Summer summer where are you ? What nice memories. I love the combination of mango and ginger, and it's a great idea to have this with other fruit. Who guaranteed you 365 days of sunshine? I'd like to have lunch with that person. I have something for you, please check my blog. What a delicious flavor combination. So delicious and healthy looking! Beautiful photos! Lovely post Meeta and I am so glad that I got to know so much about you thru this post. 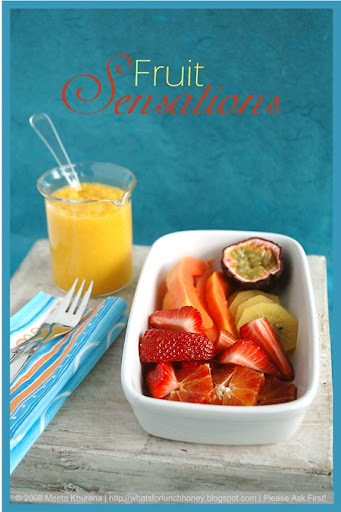 The mango sauce sounds delish.. Fresh fruits are truly 'spring sensations'. hi meeta - i too miss lovely fruit like this being available for my childhood in malawi. the mango and ginger sauce is particularly appealing. thanks for letting me share this as part of your monthly mingle! Glad you too are loving this fresh fruit platter. Thanks for sharing your thoughts. Smita I think it should be fine - check with Abby though. Sean - all you need to do is go on down to Dubai or Qatar etc. and you'll see you'll have at least 300 days of guaranteed sunshine. Then you can buy me lunch for sharing that piece of info with you LOL!